Hello families – it has already been such a busy year for the team at IHK, our assessment held on the 28th of March was a significant event for the team and committee. It was a huge achievement to receive an exceeding result in all seven areas; once again l would like to congratulate the entire team for all of their hard work and dedication to ensure that all children are receiving such a high quality kindergarten program. Moving forward for the year we are progressing on some core projects that will continue on our unique long day kindergarten program. One key initiative will be the re- view of our program structure (days) with the possibility of extending the number of days available to our three year old program. This continues our strategic vision of providing children with a two year kindergarten program provided by a team teaching approach, aiming to main- tain quality all day. We will be issuing a survey to all current and wait list parents in the next few weeks which will be reviewed in a conjunction with quality, pedagogy and professional development goals and objectives. For one child, climbing an ‘A’ frame gains physical con- fidence and a sense of achievement. For another child learning from the same ‘A’ frame is social as they col- laboratively work together with a new friend to create a game under the equipment recreating a recent camping experience. One child’s learning experience from one part of the program maybe vastly different for another. We have a number of new families this year so for those of you who aren’t familiar with how the kinder operates Isabel Henderson Kindergarten is an incorporated association of which you all as fee-paying families are members. The Committee of Management which you elect holds the license from the State Government to operate as a children’s service and is responsible for the overall management of the kindergarten. The Committee is made up of volunteers (who are a mixture of current and past families) who contribute their time to ensure the centre is meeting legal obligations, is financially sound and best able to meet the community’s needs both now and into the future. The committee of management are currently working on a number of projects including improved signage to the street, enhanced compliance and auditing system, installation of solar panels, new fund raising options for our special projects and some different social activities for families and parents. We are also currently working on a couple of grant applications, so, if you have grant writing experience or are just keen to contribute and would like to join the Committee in this role please let Nicole or Leanne know. A number of other parents have also kindly volunteered their time and expertise Pom Kimber (Will in Pelicans) has stepped down from the committee this year but is continuing to assist with the kinder communications and design. Vicki Jamieson (Molly in Pelicans) has also offered to help with organising some social events. Kath Hiatt, a past parent, is currently helping prepare a survey to assist us in monitoring community needs. The results of this survey will be used to develop the kinder offering for 2015 & beyond. Also a big thank you to Maria Arturi, Verity Campbell, Nikki Honey and Olivia Pintos Lopez who stood down from the Committee this year. Thanks Maria for your work to migrate us to Bendigo Bank and onto direct debit and electronic payments and assisting in covering us last year before we found Leanne. Verity for your work on the committee over the last couple of years achieving the ECCC sustainability award for the kinder in 2012 and working on the grant applications to the City of Yarra for the centenary book, celebration and urban orchard and in the wild and being our go to person for all things environmental. Nikki, your energy in organising the centenary and making it such a success and for administrating the grants we received last year from the City of Yarra. Olivia who has been on the committee for four years and was responsible amongst other things for our current website and many of our events posters. As a community kinder we are always keen for families to be involved as you can see this may be involvement in the committee of management and its subcommittees (eg fund raising subcommittee) offering a skill to assist in the operation of a kinder, attending working bees or other events as they come up. Alternately if you have a skill or a profession you would like to bring to the educational programme such as an instrument or a career in dentistry please speak to one of the teach ers in your room or to Nicole in the office – we would love to hear from you. During Term 2 in the 4-year-old programs of the Pelican and Kingfisher groups, we are continuing to foster the children’s sense of being and belonging. As their sense of being and belonging grows, so does their confidence to explore the programs and explore friendships through play. 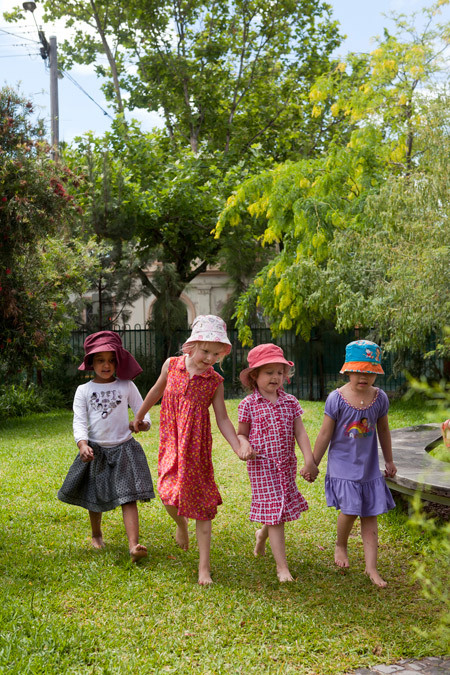 Every day at Kinder we support the children in being active participants in the group and the greater community. We ended term 1 with an incursion from Drama Toolbox, themed Jungle Animals. The children got to dress up in various costumes and role play a story. This term, as a combined group, we participated as audience members to the Lightning Creek Band. Musicians Greg and Scott sang and taught songs to the children and introduced them to numerous new instruments. In correlation to this incursion, co-teacher Laura is leading a Song Book project with the children across both groups. Co-teacher Mel is driving a group projects in the Pelican group based on the children’s strong interest in insects and their habitats. The children have been learning about Monarch Butterflies, Cabbage Moths and Case Moths, to name a few. They learned about metamorphosis and the life cycles. One of our children even brought in mosquito larvae from home to share with the group. Other group projects include sowing seeds, planting the seedlings, cooking and The Rubbish Project. In one week all groups sorted the compost, recyclables and collected the rubbish. Once washed we weighed the rubbish and found we had over half a kilo of waste, just from lunchboxes! The children were then asked ‘where does this rubbish end up?’ and ‘what happens to it once there?’. Most children answered ‘the rubbish truck’ or ‘tip’ but were unaware of what happens at the tip. Group projects such as these opens up discussions to explore ways of minimizing our impact on the envi- ronment as well as giving the children opportunities to broaden their understanding of their world. Links to Early Years Learning and Development Framework. Children develop an awareness of the impact of human activity on environments and the interdependence of living things. In the Budgies we support children’s early lit- eracy in a range of ways. Imaginative play gives children the opportunity to create stories, engage in social conversation with peers and become flexible in the way that they use language. At group time we repeat familiar stories so that children are able to tell them on their own. As the children re-read the book they become familiar with the language and become confident ‘readers’ In this photo Hugo is reading ‘press here’ for the group. In the second shot Thaleia, Harvey and Laz are recreating the story ‘Wombat stew’ through dramatic play. Play is the natural language of children and we provide the time, space & adult guidance for them to develop their language skills in ways that are fun, engaging and motivate children to learn. This year at IHK we have been exploring The Project Approach – an inquiry based approach to learning in the early years. These projects exist in conjunction with regular programming. The Project approach integrates learning across all domains including language and literacy, numeracy, science, the arts and creativity while focussing upon an area of particular interest to the children. We began by documenting and extending a range of interests the children demonstrated enthusiasm for in term one, before refining our project topics in term two. The Budgies have been exploring the world of the Arctic and Antarctic icecaps through play, books, photographs, stories, drama and movement, art and science experiences. We encourage children to ask questions, for example: how tall is an Emperor Penguin? Then hypothesise and investigate the answers. Provid- ing open-ended sensory stimulus also encourages learning, for example an art experience centred around a giant melting iceblock and coloured dye supports children to explore the scientific concept of phase transition and states of matter. Much of the learning for each of the groups will be documented on the walls and windows at Kinder so that children, families and teachers may continue to engage and contribute to our projects. We welcome families who may have knowledge or interest in these project areas to become involved share their experiences with us if they are able. Over the term the children and I have been extending our ideas about weaving and develop- ing the projects that we have been working on. The large natural loom in The Wild is becoming more interesting by the week. As the trees were turning, one of the children that I was working with suggested that we use the leaves somehow. This idea lead to a great process of collecting, choosing, tying and then gently threading the leaves into the loom. We also took the idea of the changing environment to create smaller weavings, also using leaves, and au- tumn coloured wools and as a few of us sat around the table the idea was raised to hang them in a tree that had similar colours. It was wonderful to see and talk about this tree as the weavings went up and the leaves fell away. So please if you have not already checked out The Wild or our Autumn Tree, make sure you do. Our April School Holiday Program was full and fun packed. We enjoyed some clay and wood- working experiences and the children created plaster casts of their clay pressings. Our camping day was very busy, setting up tents, cook- ing soup and damper and singing campfire songs. We ventured out on two excursions and had a visit from Bridget from North Fitzroy Library. We finished our program with loads of Easter celebra- tions including an egg hunt and some traditional Greek Easter cooking. We look forward to the June/July Program more excursions, continuing our link to the local community and enjoying a variety of new experiences.